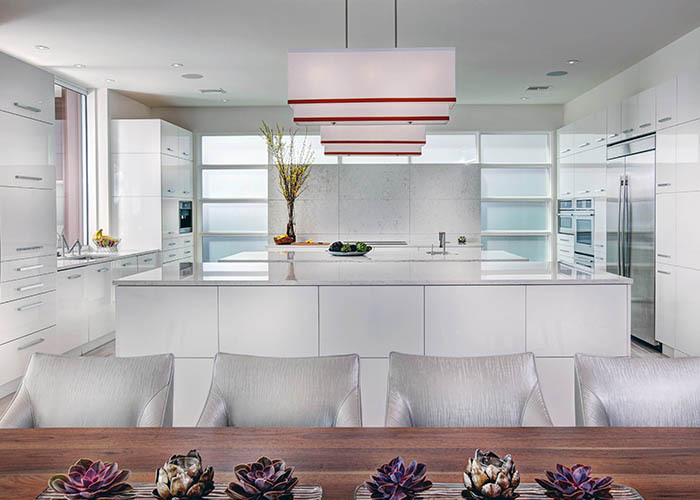 Bold yet timeless and sleek but functional, our Lake Tibet kitchen remodel and its striking, all-white features earned Winter Park custom home builder, Phil Kean Design Group, the “Room of the Year” recognition at the 2013 Best in American Living Awards. Developed with both style and practicality in mind, this kitchen incorporated one of today’s biggest trends: the all-white interior. The monochromatic appeal of an all-white kitchen has emerged as one of 2014’s most sought after styles, and for good reason. Clean lines, solid colors and quartz slab accents create an instantly sleek and modern atmosphere while retaining a classic, timeless allure. Finished off with modern hardware and ample counterspace, the trend shines a light on this kitchen’s best features while remaining 100 percent functional and ready to take on extensive food prep. Wanting to infuse the luxe feel of an all-white interior into a fitting environment, our team of modern home builders and designers developed and constructed this legendary space within an Orlando, Florida home. Alongside the “Room of the Year” Award, this remodel also earned a Platinum Award in the $100,000 and Over Kitchens category. Showcasing the home’s scenic lake views, we opened the kitchen’s floor plan to the outdoors and allowed plenty of room for entertaining and meal preparation. As is typical of our approach to design, we successfully blended beauty with functionality by including storage underneath both islands and a hidden walk-in pantry with second refrigerator. All-white cabinetry and quartz counters allude to Scandinavian design elements, while the stainless steel hardware and appliances add minimalist flair. While incorporating trends and modern options can create inspiring spaces, it is important to infuse a few distinguishing touches to make the project truly stand out. We chose to use fabric-covered light fixtures and a textural ledgestone feature wall to warm up the room, but were careful not to disturb the monochromatic focus. As an architectural element and to also provide privacy from neighbors, we framed the exterior kitchen wall with frosted glass. Corner pocketing glass doors and a pocketing pass-through window were incorporated for easy access to the home’s lanai. For more information on the pocketing glass doors and windows, visit windoorinc.com. To see more of our modern home plans and custom designs, visit our portfolio.